Minnesota:	Leaders of immigrants rights and poor people's movements speak at RNC protest conference | Fight Back! Angel Buechner, a leader of Welfare Rights Committee. 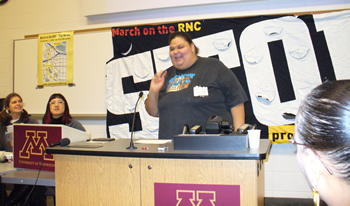 Minneapolis, MN - Carlos Montes, of Latinos Against War and veteran leader of the Chicano and immigrants right movements, along with Angel Buechner of the Welfare Rights Committee were among the many prominent activists who addressed the Feb 9-10 Organizers Conference here to prepare the massive anti-war march planned for the opening day of the Republican National Convention. The Organizing Conference brought together the leading centers of the anti-war movement and many other progressive movements. Fight Back! will be providing additional audio and video coverage in coming days. 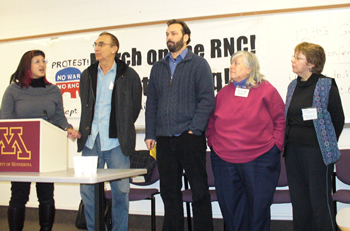 Click here for additional previously posted podcasts from the February 9-10 RNC protest conference.